HRA Studios and Foundation (formerly the Hollywood Rock Academy) is a creative community that allows people, young and old, to find their voices through musical and artistic expression! In a band or want to join a band? This is the place for you to learn, jam, record, write, get coaching and just have fun! If you are interested in learning to play music, but are not quite sure what instrument you’d like to play, HRA Studios is for you too. You can sign up for private lessons where you can explore a variety of intruments until you find one that suits you. Have music that you’d like to record? HRA has that covered too! They have a recording studio right on site! Proceeds from all HRA events, concerts, and CD sales go directly to the chosen community supported by the HRA Foundation. Much of the work that HRA does involves at risk youth, children with chronic illness and the elderly…finding a way to give them a positive light through music and art. I recently sat down with HRA President and founder, Matt Wilczynski to see what was new with HRA and share the wonderful work he is doing with all of you. 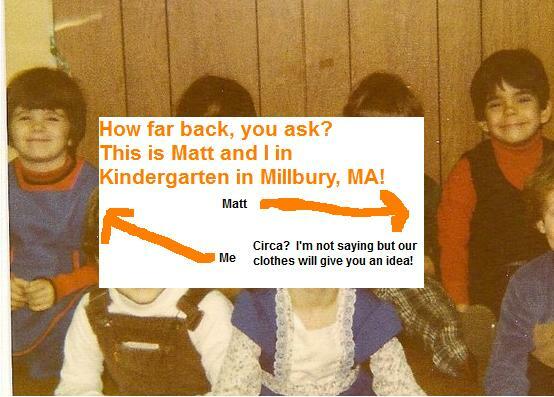 Matt and I go way back. Really…check THIS out. Christy: How did HRA come about? Christy: Over the past 8 years, how has it evolved? Matt: Starting with rock music was cool, but with the emergence of all of these corporate “rock schools” I decided to keep our DYI method of having REAL bands play their own music. Not always easy. Try keeping a band together on a normal day. Now, have all of the members be 13 years old with crushes on each other! In keeping it all focused on original material, we also branched out into making original films, literature, theater and even sketch comedy. Mostly though – HRA is a place for kids that have chronic illness to come and write a song about what they are feeling. It’s a place for the elderly to find a renewed creative purpose. A haven for those with mental illness to unleash their voice in a positive and healthy CREATIVE way. Christy: In addition to the year round activities that happen here, do you have any new programs coming up? Matt: We start our next Winter Camp on Monday December 19th, with a new session each week through January 9th. At our camp, you do more than have a “rock band” – the kids produce an original film, create “Funny or Die” style sketches, publish a comic book – whatever I need to do to get them off the cellphone and away from the computer. Christy: Sounds awesome! I think a lot of us could benefit from that! Here are some photos I took at the recent HRA Studios Holiday Concert at the Key Club. This entry was posted in art, education, music and tagged children, education, HRA Studios, lessons, los angeles, music, school. Bookmark the permalink. 2 Responses to HRA Studios- A place to find your voice through musical and artistic expression! What a wonderful program and so needed!